Some at Carolina remember Donnie Hoover ’71 as one of the “Charlotte Mafia,” walking beside members of Kappa Alpha Order in the “Beat Dook” parade to remind the fraternity brothers that plucking African-American children from neighborhoods near campus to ride on a “Spook Dook” float would not be welcome. Others know he rose through the ranks at the U.S. Department of Justice at a time when black supervisors were unheard of and unwelcome, and has been re-elected twice as a District Court judge in Mecklenburg County. Lynn Bush, now a federal court judge and a former colleague of Donnie’s at the DOJ, recalls his extraordinary kindness. When her mother died unexpectedly, Donnie traveled to Arkansas for the funeral, and when he arrived at the wake and realized she had not thought to arrange music, he sat down at the piano in the room and played a beautiful tribute to her mother, and played until the last guest left. Donnie lives his life as an illustration of the line from an Edgar Guest poem, “I’d rather see a sermon than hear one any day.” Soon after he arrived on campus, one of only 19 African-American students in his class, he realized “there were things going wrong that needed to be brought to the forefront and dealt with,” he said. He joined a handful of others to form the Black Student Movement. They organized a strike to bring attention to the workplace injustices of the cafeteria workers. Their list of demands included that the University institute an academic program in black history and that more black faculty be hired. Donnie was one of UNC’s first two students to graduate with a major in Afro-American studies. Though he had no intention initially of going to law school, he came to see law as a way to help people. He enrolled at North Carolina Central and, as president of the law students’ association, lobbied hard for recruiters to come to the school. When they did, he signed up to interview with every one, to encourage them to return. Even so, the Justice Department recruiter said he and his colleague had flipped a coin to see who would come to NCCU, and “I lost, so I’m here.” He was offered the job, and he arranged his start date to coincide with getting the results of his bar exam. Donnie had planned to tell the government he changed his mind if he passed the bar; but the results came late — he got his passing grade in the mail when he got home after his first day of work. He stayed in Washington nine years, once again bringing to the forefront things that needed to be dealt with, standing up for the few minorities and women in the federal prosecutor’s office. He earned the respect of even the most belligerent superiors and co-workers. “He speaks with a disarmingly slow Southern accent that doesn’t put you on notice for the razor-sharp wit and sense of humor he has,” Lynn Bush said. When Donnie and his wife returned to Charlotte to raise their children near family, he entered private practice, taking on cases that needed to be handled, not based on who could afford to pay. At one point, his wife threatened to put one of their babies’ shoes on his desk to remind him he had bills to pay. In 2008, Gov. 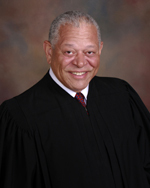 Bev Perdue appointed Donnie to the bench in Judicial District 26, and he has been re-elected twice. His success has been fueled by his intellect and integrity. Despite a very crowded docket, he takes time with each case to put himself in the defendant’s shoes, to understand the path that brought that person to court and what would work to keep him or her from returning on other charges. He noticed the many veterans appearing before him, and he got a grant to set up a jail diversion program for veterans. While teens often want to plead guilty and move on, Donnie takes the time to craft sentences that enable teens to expunge the conviction from their record to eliminate an obstacle to finding work. When Donnie heard that legislators determine the need for jail cells by looking at the results of third-grade end-of-grade exams, he began volunteering in the school system’s Truancy Court Program and serves on the board of the Greater Enrichment After School Program. In 2007, Donnie helped found the UNC Black Pioneers, navigating the wounds from those early days as students to unify the voice of the school’s first black alumni. It started with a half dozen of his classmates emailing one another.